SNAFU! 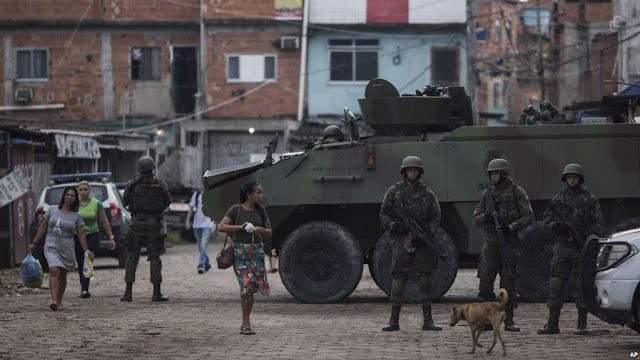 : Brazil's Lower House Approves Military Intervention in Rio...Are American cities next? Brazil's Lower House Approves Military Intervention in Rio...Are American cities next? Brazil's lower house approved a decree to put the military in charge of Rio de Janeiro's security forces early Tuesday as soldiers and police spread out throughout in the city to combat rising crime. The military took over Rio's police on Friday, but the presidential decree still needs congressional approval. The Chamber of Deputies has sent the measure to the Senate, which was scheduled to debate it later in the day. Overnight, the armed forces and police spread out in in Rio in the first major operation since the change in command. They took up positions on major roads that connect Rio with the rest of the country in an effort to prevent drugs, illegal arms and stolen goods from entering the city, said Col. Roberto Itamar, a military spokesman. Around 3,000 members of the armed forces were involved. Armored vehicles rolled through the streets of one neighborhood on Guanabara Bay on Tuesday, while boats patrolled the waters. Soldiers and police set up checkpoints and searched everyone leaving or entering during the morning commute. We're having a "police" debate on my gun control posts today (make no mistake about it...I'M TOTALLY AGAINST IT...I WAS BORN FREE!) and police shootings are being discussed too. My views on militarized police have evolved. I was against it. Now? Well with a bit of info I've come across I'll give them what they need to get the job done. 1. Reports of the Cartel operating in Houston, Los Angeles and a few other cities has hit my inbox. Old news to you? New to me. If they've been operating in our country for awhile now then I'm amazed they've been able to keep things as under control as they have. But make no mistake about it. If they're in those cities we will eventually see the same type violence here as we see in Mexico. 2. You don't want an American city to have to deal with the Rio situation. The last thing the American people need is to have a Marine Corps Infantry Battalion rolling down its streets doing police work. You want to see mean and nasty? That will be mean and nasty. They will do their best to moderate, to be friendly and to not alienate people, but they're not trained for police work even if the COIN mafia wants you to think so. Give the police Abrams M1's if that's what they think they need but we do NOT need to wake up to an America city going thru what's going on in Brazil.